Our organization specializes in manufacturing, supplying and exporting a wide assortment of Energy Food Packaging Containers. The superior quality raw material is procured from the authentic vendors of the market, who make use of high-grade raw material in the manufacturing process. Moreover, in order to meet the diverse requirements of our customers, we offer these containers in various sizes, designs and specifications at market leading rates. Established in the year 1991, we, “Havmor Plastics”, are recognized as the prominent manufacturers, suppliers and exporters of a wide range of Plastic Food Containers for Dairy, Restaurants, Ice cream, Sweet & Pharmaceutical industries. We also got wide range of Disposable Plastic Molded Spoons. 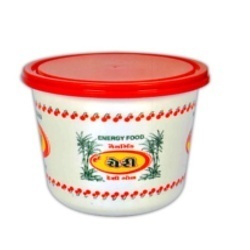 Our range includes Plastic Sweet Boxes, Shrikhand Container, Disposable Spoons and Ice Cream Boxes. In addition to this, we offer Khakra Boxes, Food Packaging Containers for Jaggery & Ghee Packing. These products are manufactured using virgin food grade plastic which gives supper finish and durable product. Our products are 100% recyclable & eco-friendly. We offer these products in various sizes and shapes, which can also be customized in compliance with the requirements of our customers with competitive price.